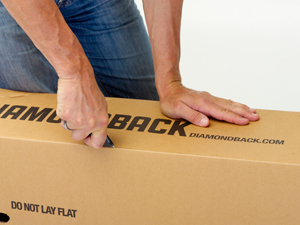 Begin by carefully opening the box. 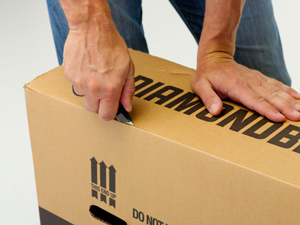 Please be aware of the sharp staples that may have been used to secure the box and be mindful not to cut yourself. 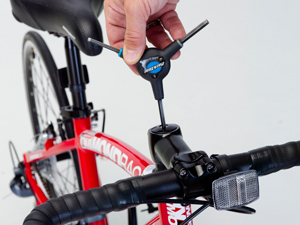 For assembly you will need: cutters/scissors; #2 Philips head screwdriver; a 4, 5, 6mm Allen wrenches. 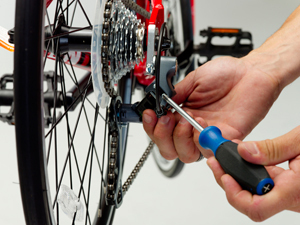 If for any reason, you do not have the proper tools or are not confident to safely assemble your bike yourself, it is recommended that you take your bike to a local bike shop for assistance or to have them assemble it. 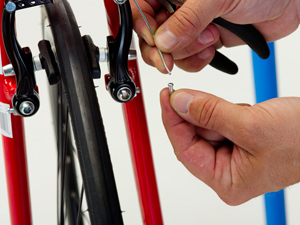 We recommend taking all bikes to a bike shop for a safety check before riding. They may charge you a fee to do any of these services. 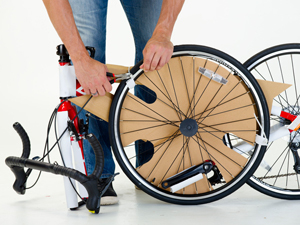 Detach the front wheel by cutting all zip ties holding it on. 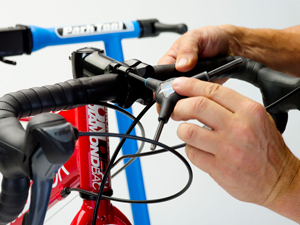 Detach the handlebar by cutting all of the zip ties that may be holding parts together. 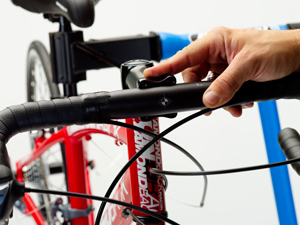 Be very careful not to cut any of the bikes shifter or brake cables while doing so. 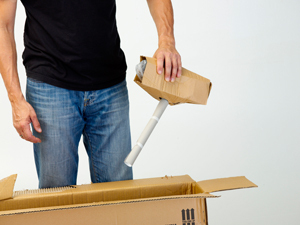 Then remove all of the packing material from the frame. 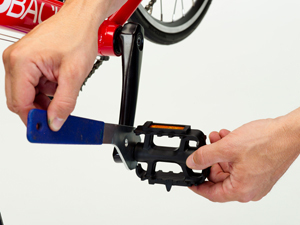 Loosen the seat clamp and insert the seatpost into the seat tube. 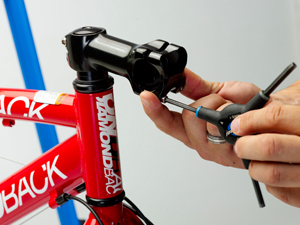 If you have bike grease you can apply a small amount to the seatpost before inserting it. 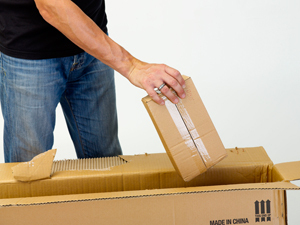 Make sure that you have inserted the post past the minimum insertion/maximum extension line (printed on post near bottom). 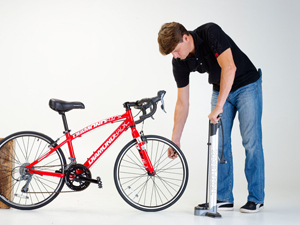 When the bike is fully assembled you will then be able to fine tune the saddle adjustment based on your height. 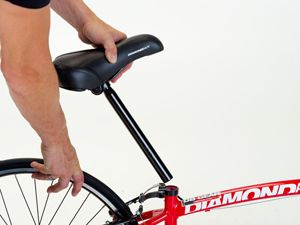 Refer to the Saddle Position section on page 12 of the DB Owner's Manual for guidance. Next remove the stem bolts and faceplate. 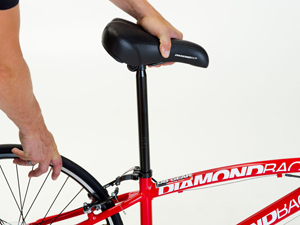 Place the bar in the stem and loosely re-secure the faceplate to the stem. 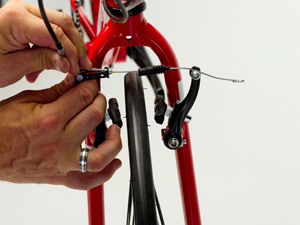 Be sure your cable routing is suitable and that there are no harsh bends or kinks in the cable. 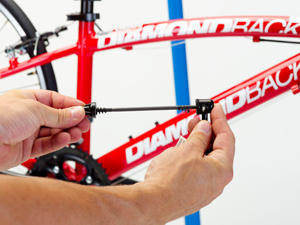 Once the handlebar is loosely placed in the stem, make sure that it is positioned symmetrically before tightening the faceplate bolts. 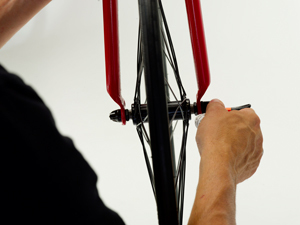 When tightening the bolts, tighten them alternately (use an "X" pattern) to ensure that the faceplate is equally tight on every side. 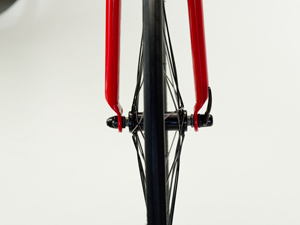 The gap opening between the faceplate and the stem should be equal both on the top and on the bottom. 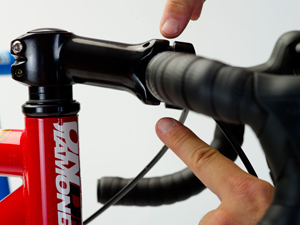 NOTE: stem bolts are typically tightened to 4nm. 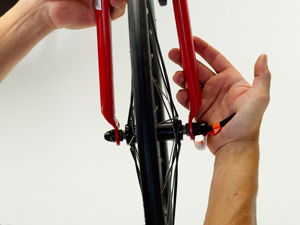 Now that your handlebars and seatpost are securely fastened, it's time to get your front wheel ready for installation. 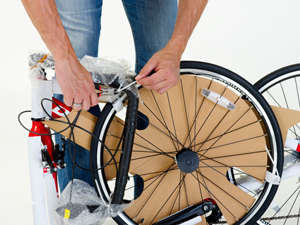 Start by pulling the plastic protective caps off of both sides of the front wheel axle. 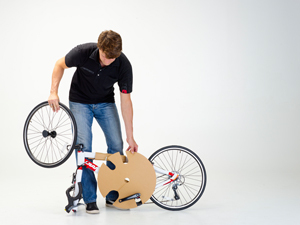 Now install skewer through the axle of the front wheel. 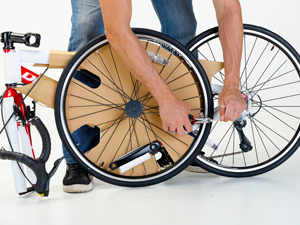 Remove the non-lever side of skewer, as well as one spring, and proceed to insert through the front wheel axle. Put the spring back on the skewer. 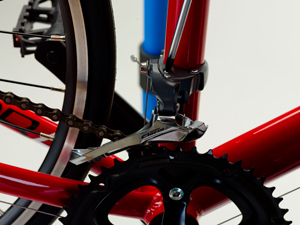 Note the correct positioning of the springs on the skewer when mounting (smaller part of spring points in towards hub and spokes). Thread the skewer nut back on a few turns. 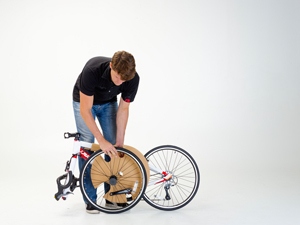 Insert wheel into front fork. 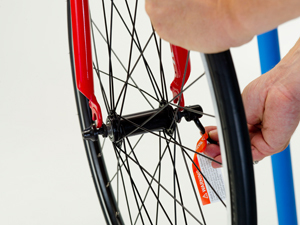 Make sure wheel is centered in fork. 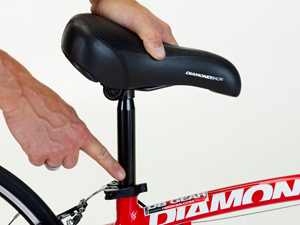 Note that the quick release lever should be on the non-drive/left side (when sitting on the bike). 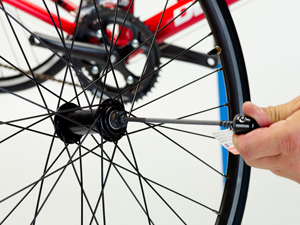 Once the wheel is in the fork tighten the skewer nut until it touches the fork lightly. 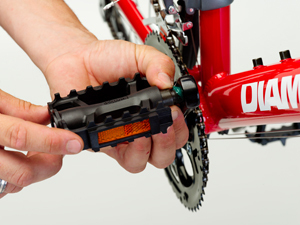 The quick release part of the skewer should be on the non-drive/left side (when sitting on the bike). Then start to close the skewer lever. The QR lever should close with some resistance, but not too much that is hard to close open. 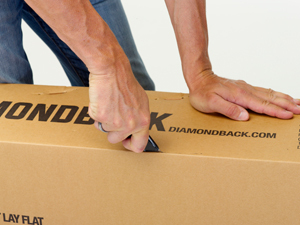 When closed, make sure that the QR lever is tucked up to avoid snags. Now it's time to adjust the front brakes. 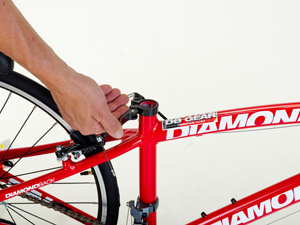 Disconnect the brake lever springs from the lever arms. 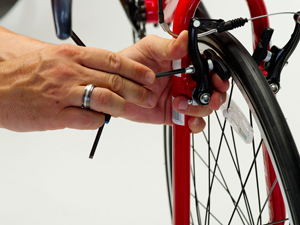 Next, grasp brake pad and lever arm in one hand, and loosen brake pad bolt. 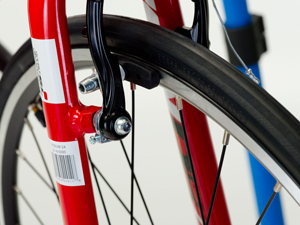 Align pad to be parallel with rim surface and retighten brake bolt. 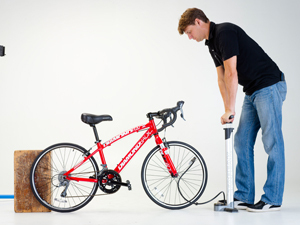 You do not want the pad to come into contact with the tire. 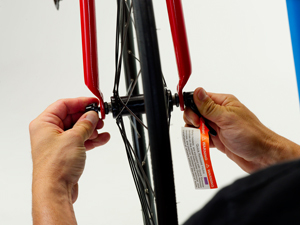 Check to make sure both pads are hitting squarely in center of the rim braking surface. 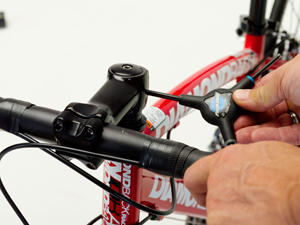 Reconnect the brake lever springs to the brake lever arms. 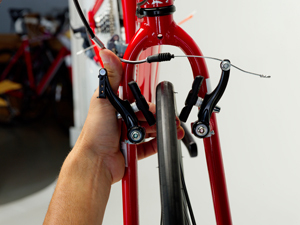 Reconnect the front brake by squeezing both brake lever arms together with one hand. Then pull on the aluminum cable noodle in one hand while hooking the lower end of the noodle into the slotted link on the brank arm. 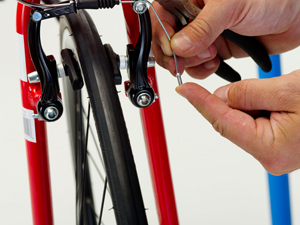 If it is too difficult to connect the noodle you have to release a little cable tension by loosening the cable anchor bolt and giving the cable a little more slack. Make sure to re-tighten the anchor bolt. 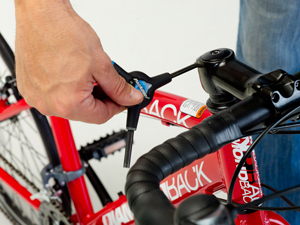 pull the cable to remove excess slack and retighten the cable anchor bolt. 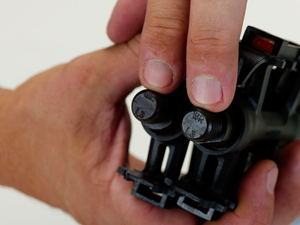 Trim cable and crimp cable cap. There should be 2-3 inches of cable left after trimming. 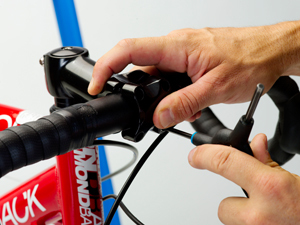 Tuck cable away and crimp cable cap to avail the cable unravelling, neatly behind brake lever arm. 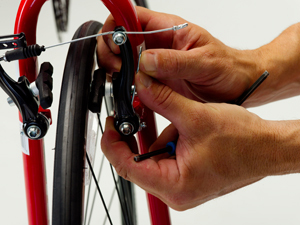 Do the same for the rear brake as you did for the front as the brake pads may need adjustments. 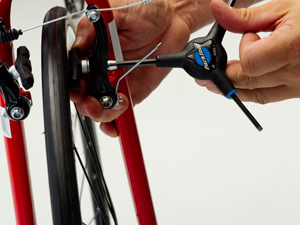 Release the spring from brake lever arm. Next, grasp brake pade with one hand and loosen break pad bolt. 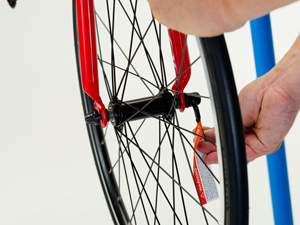 Align pad to be parallel with rim surface and retighten brake bolt. You do not want the pad to come into contact with the tire. 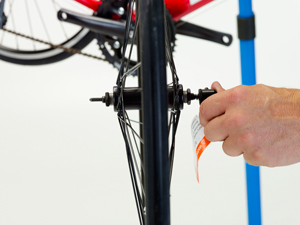 Check to make sure pad is hitting squarely in center of rim braking surface. 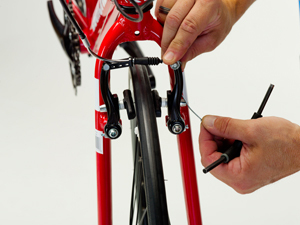 Reconnect the lever spring prior to reconnecting the rear brake cable noodle. 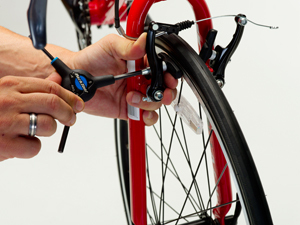 To reconnect the rear brake pull on the aluminum cable noodle in one hand while hooking the lower end of the noodle into the slotted link on the brake arm. 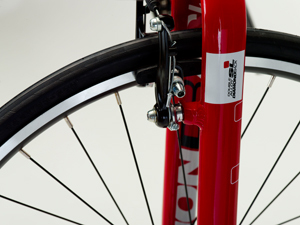 If the front or rear brake pads are not hitting the braking surface of the rim evenly – one pad is hitting the rim braking surface before the other - use the cantilever spring tension screws to adjust. 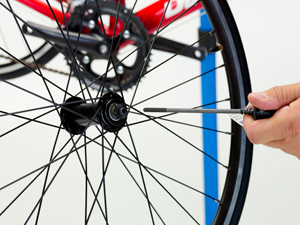 For example, If the left brake pad is hitting the rim brake - surface sooner than that of the brake pad on the right, give the spring tension adjustment screw on the right side lever a turn or two to increase spring tension. 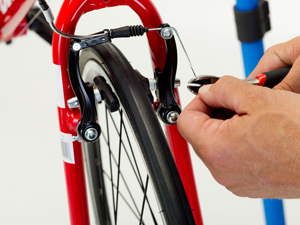 If the cable tension needs to be increased for better braking, loosen cable anchor bolt. 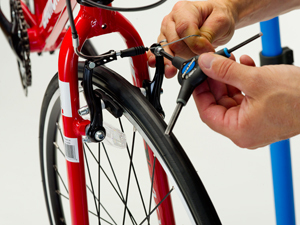 Remove excess cable slack and re-tighten cable anchor bolt. 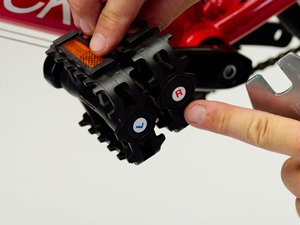 For pedal installation, your pedals will show what side they are meant to go on with an "L" or "R" on the end of the spindle or axle (depending on the pedal). 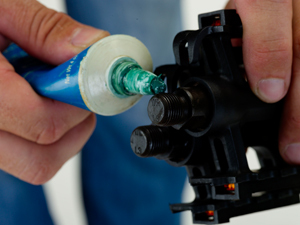 We recommend applying a small amount of grease to each the threads of each pedals thread before installing. 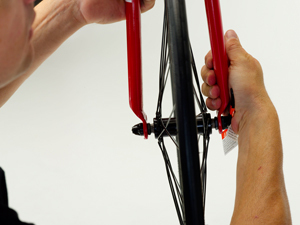 Start by hand threading in the left, non-drive side (when seated on the bike) pedal. 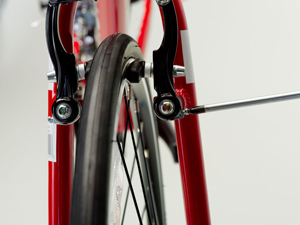 The left pedal will be indicated by an "L" on either the end of the spindle or on the axle (depending on the pedal). 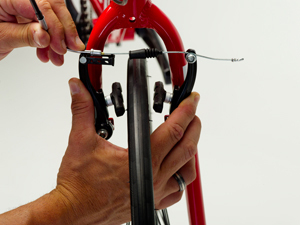 Tighten by turning your 15mm to the left (counter clockwise). 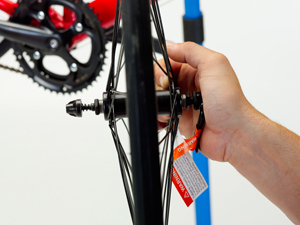 Take the right pedal (this should be indicated by an R on the pedal which can be seen on the end of the spindle or on the axle depending on the pedal) and thread into the drive side crank arm (right side when facing forward on bike). 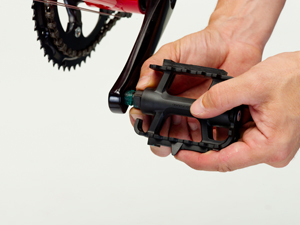 Tighten by turning your 15mm pedal wrench to the right (clockwise). 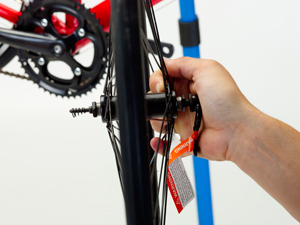 Make sure that low adjustment screw ("L" stamped on Derailleur) is set to ensure it hits the stop and the derailleur cannot shift the chain past the lowestr gear (largest cog) and into the spokes of the rear wheel. 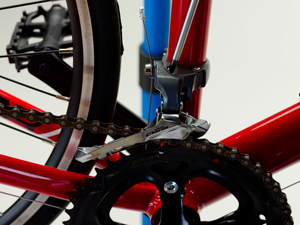 While pedaling the bike, shift the rear derailleur to the highest gear (smallest cog) in the rear. 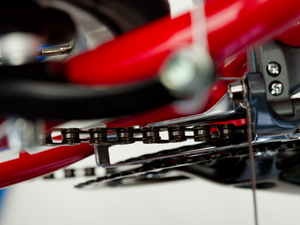 Check the adjustment of the high limit screw ("H" stamped on derailleur) to ensure the derailleur cannot shift the chain past the high gear (smallest cog) and into the frame. 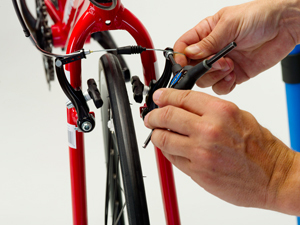 For proper rear derailleur alignment refer to the manufacturer's instructions for your specific derailleur model. 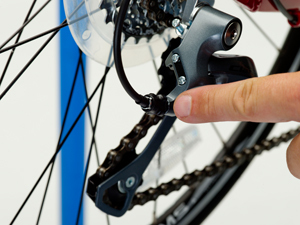 Form Shimano, the derailleur jockey wheel should line up directly below smallest cog. 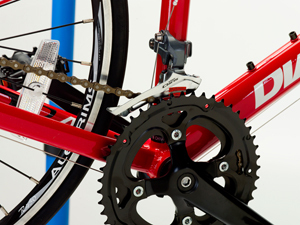 On SRAM, the jockey wheel should line up just to the right of the smallest cog. 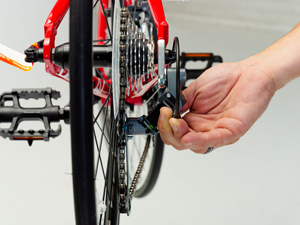 Now it's time to make sure the rear derailleur will shift appropriately up and down the rear cog set. 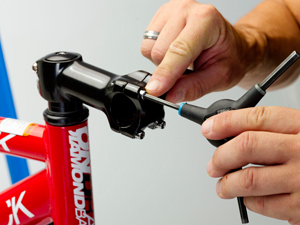 Proper shifting is all related to cable tension. 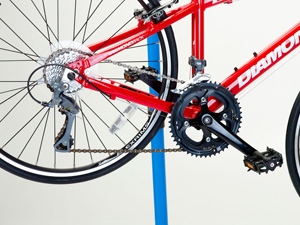 Begin by pedaling bike with the chain in the highest gear (smallest cog). 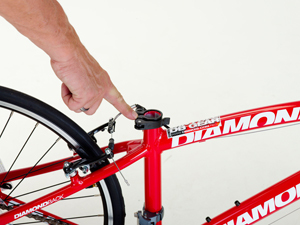 Each "click" of the shifter lever should correspond to the chain moving up the gears one cog at a time. 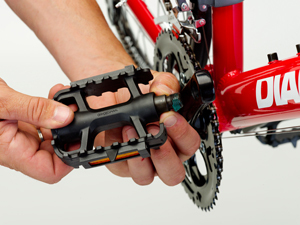 To adjust the tension, use the adjusting barrel at the derailleur/or at the shifter to tune the shifting. 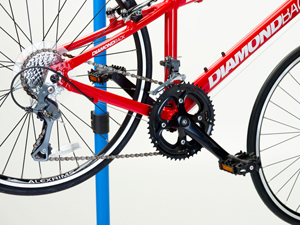 If the chain shifts past the desired gear, the cable tension is too high. 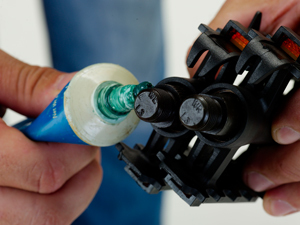 Turn the adjusting barrel clockwise to ease cable tension. 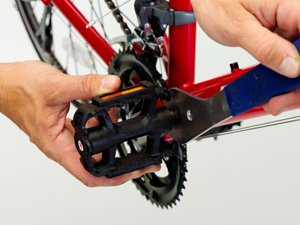 If chain is not shifting to desired gear, turn adjusting barrel counterclockwise to increase tension on cable until chain shifts to desired gear. 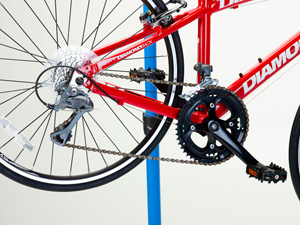 Set derailleur angle so outside plate lines up with large chain ring. 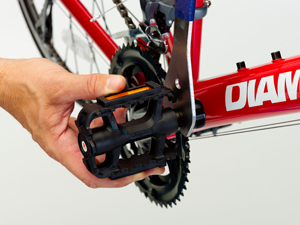 Make sure that the chain is sitting on the smallest chainring (if there are only two) or in the middle chainring (if there are three). 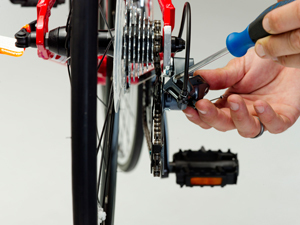 Now it's time to set front derailleur adjustment screws. 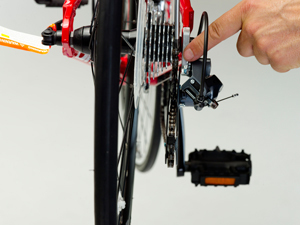 To start this step, shift the rear derailleur so that the bike is in its lowest gear (largest) cog in the back. 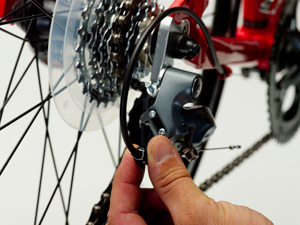 Make sure the front derailleur is set so that the chain is in the lowest gear (smallest cog) in the front. 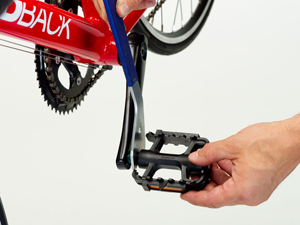 Next, shift the rear derailleur so that the bike is in its highest (smallest) cog in the back and the shift the front derailleur into the high gear (largest chainring). 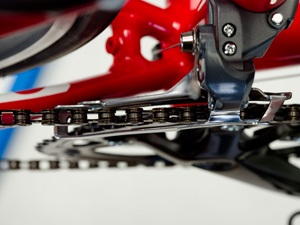 Set the High limit screw ("H" stamped on Derailleur) so that the outer Front Derailleur plate is approximately 1-2mm from chain. 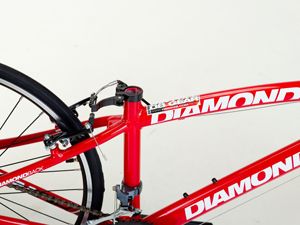 While the handlebars are still aligned with the front wheel, tighten stem bolts. 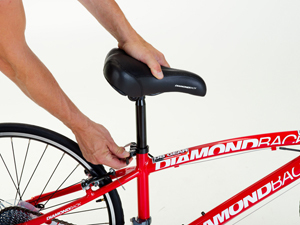 the handle bars are tight and don’t move when you hold the front wheel between your legs and twist them. 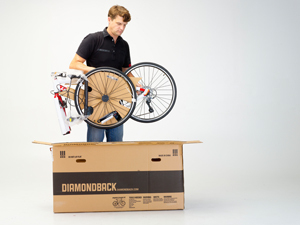 If, for any reason, you do not have the proper tools or are not confident to safely assemble the bike yourself, it is recommended that you take your bike to a local bike shop for assistance or to have them assemble it. 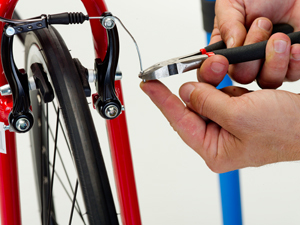 We recommend taking all bikes in for a safety check before riding. They may charge you a fee to do any of these services. 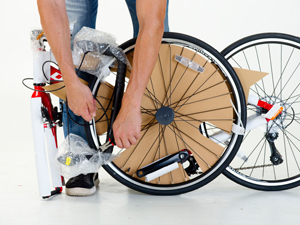 Any damage caused by improper assembly is not considered a manufacturer defect and will not be covered under warranty.